Organised by the national section of IEEE, in partnership with the local group from Porto, the event had the collaboration of INESC TEC in a partnership with the Centre for Robotics and Intelligent Systems (CRIIS) and the Centre for Enterprise Systems Engineering (CESE) under the ScalABLE and FASTEN projects. Rafael Arrais, collaborator of CRIIS, was responsible for a collaborative robotics workshop with a demonstration entitled “Collaborative Robotics: Interactive Augmented Reality System for Assembly Operations”. 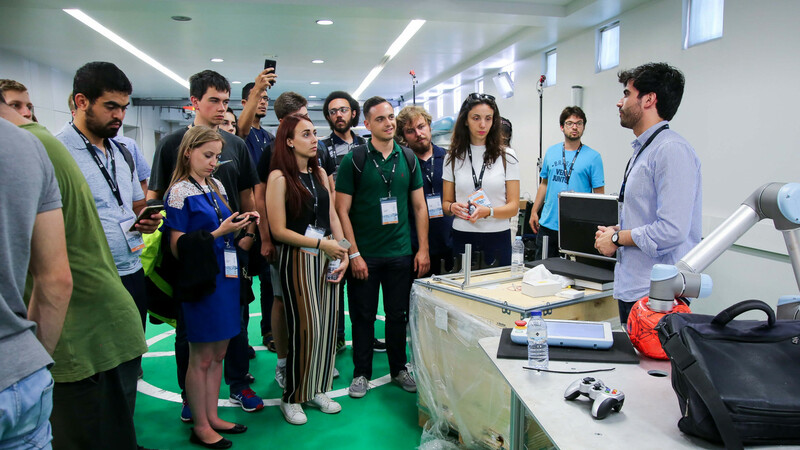 The programme also included a visit to the Laboratory of Smart Grids and Electric Vehicles, which was led by João Ramos from the Centre for Power and Energy Systems (CPES). INESC TEC was also present at the job fair, held on 26 July, in which the institutions had the opportunity to present themselves and to attract students and young professionals that were present in the event. Carlos Costa, Luís Carlos Santos, Tiago Pinto and Paulo Rebelo from INESC TEC were responsible for demonstrating some of the mobile robots of CRIIS to the participants. The IEEE SYP 2018 is composed of multiple parallel workshops and several lectures, as well as leisure moments and social programmes. Around 500 participants from more than 40 countries attended this edition. Since 1998 that, every two years, the IEEE SYP 2018 gathers students, young professionals, business representatives and academics, aiming to foster the interest in engineering areas through different activities both technical and cultural. It also provides an opportunity to develop a specialised network of contacts, as well as to have access to information about projects and job offers.